By Katrina Blair, Well Being Journal, Vol. 25, No. 1. There are more than fifty species of purslane growing worldwide, although Portulaca oleracea is one of the most commonly widespread varieties found in temperate and colder climates. Purslane is a low-growing fleshy succulent herb. It often has reddish stems that spread horizontally across the ground. It has stems that branch out from a central root and create a mat over the ground. The leaves are smooth and shiny and have a teardrop shape that is more narrow where it meets the stem and wider on the outside edge. They are juicy and plump with liquid. Each leaf attaches directly to the reddish stem without a stalk and they are both alternately and oppositely attached. In colder climates, purslane emerges from the winter’s hibernation only once the temperatures increase in heat toward late spring or summer. In warmer climates, it grows year-round as a perennial. The flower is delicate, small, and yellow with five petals. It only opens for a short time in the presence of bright sun. The seeds are tiny, round, and black. They are formed in cuplike containers after the flowers have completed their growth cycle. The little black seeds spill out of their container once ripe. One plant can produce more than fifty thousand seeds. The seeds have evolved to endure over time and ensure reproductive success. Each seed has the ability to survive over forty years in a state of dormancy before germinating. The whole plant is considered a prostrate weed, which means it grows low to the ground. The stems are reddish and the roots are whitish or light yellow in color. The roots reach down close to 12 inches in depth and spread out in all directions in a radius of about 6 inches from the center. It is considered a primary succession plant and is one of the first crops to find its niche in barren lands. It is a beneficial plant that helps prevent moisture from leaving the ecosystem. As a ground cover plant, it protects the ground fertility by keeping water from evaporating and wind from blowing away precious developing topsoil. As a succulent ground cover, it supports other crops such as cultivated vegetable plants from experiencing drought conditions by creating a humid microclimate. Purslane’s roots are taproots with stringy rootlets reaching out to bring up nutrients and help break through hard soils, all while stabilizing the moisture in the soil. Purslane, although a succulent, has also evolved in hot and dry environments. When it becomes stressed by low water availability, purslane changes to a photosynthesis process using crassulacean acid metabolism (the CAM pathway). This process allows purslane in the evening hours to trap carbon dioxide with its leaves and convert it into malic acid. During the daytime, the malic acid is converted into glucose. Because of this characteristic, purslane leaves will taste different in the morning than in the evening. In the morning, purslane leaves contain as much as ten times more malic acid, making them very sour tasting. If you prefer a milder tasting purslane, harvest your greens in the late afternoon, and if you want more zing to your recipes, gather the leaves at dawn. Purslane may often be considered a garden weed to discard, but if one is wise to the many benefits of purslane, it becomes a highly prized harvest. Purslane is viewed as a jackpot on our farm, and is delicious at all times throughout the year. It has a very mild and agreeable sour flavor that enriches salads and adds juice and flair to many of the dishes at our café. I harvest the whole above-ground parts and leave the root in the ground to keep growing. I do not purposefully plant purslane, but luckily it manages to find a way into my greenhouse beds, flowerpots, and vegetable starts. Nearby farms call me to harvest their purslane crop before they weed whack it out. I gladly accept; it grows as a mini ground cover that provides an easy harvest. Depending on where purslane is growing, the juicy plant can also taste lightly salty. When I use purslane in my recipes, I rarely separate the parts from each other. I love to use the whole upper plant, including the leaves, stems, flowers, and seeds. One year there was so much purslane growing on my friend Carl’s land that he harvested a 20-gallon bucket full and brought it to me. I felt rich and somewhat overwhelmed with his purslane gift. What was I to do with all of it? I tapped into some creativity. My friend Bevan loves our sauerkraut and likes to trade his homegrown vegetables for some of our homemade kraut. We were out of cabbage and I decided to try to make purslane sauerkraut this time. I mashed up the purslane with some salt and packed several gallon glass jars with the slimy mixture to culture for seven to ten days. In about a week’s time, the smell was telling me it was time to investigate and unpack the jars. It smelled great, just like any sauerkraut. It looked a little different, full of leaves and stems, and rather green, but the taste was wonderful. The major difference was the texture; purslane sauerkraut is much more slimy. It is more like natto, a slimy Japanese fermented soybean dish. Bevan was a willing guinea pig for tasting our wild weed kraut and he even acknowledged he was better off from the whole experience. He obviously liked it because he ate the whole jar and asked for more! 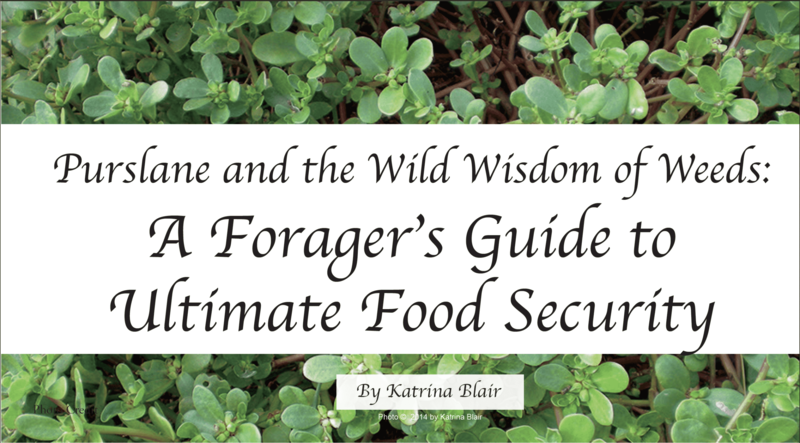 The wild beneficial nutrition from the purslane outweighs plain cabbage in its healing and nutritive value. I salute purslane and recommend experimenting with its myriad uses. When there is a local bounty, culture the remainder of what is not eaten fresh. The purslane will store for months after fermenting it and continues to offer high levels of vitamin C, enzymes, and omega-3 fatty acids in addition to a host of other nutrients throughout the winter months when they are needed the most. During the summer season, I use purslane as a soup base, a cracker ingredient that will become the binder of the other ingredients, and even as a dessert. Purslane makes a wonderful base for a lemon pie, as it creates a slightly gelatin-like texture. I add lemon and honey, to make the pie a sweet and sour delight. The crust is a lightly “buttery” crust made of buckwheat, coconut oil, a pinch of salt, and dates. The filling is simply purslane, honey, and lemon. Blend the filling together and pour it into the crust. Chill for an hour and serve this divine purslane lemon pie! If a slight thickener is needed, you can add half an avocado. Another recipe included later in this article is a purslane peach pie—also divine! Purslane is one of the “beauty plants.” It supports our beauty both from the inside when we ingest it and from the outside when we apply it to our bodies. It is succulent and full of mineralized water and nutrients, making it the perfect facial, addition to bathwater, and hair and skin conditioner. When it is in season, I love to harvest purslane daily and use it as part of my self-care practices. When I make a purslane juice for breakfast, sometimes I strain out the pulp and wash my face with the poultice. Purslane reminds our skin and tissues to be turgid, toned, and hydrated. When we make purslane part of our daily rituals both internally and externally, we start to embody its gifts of handling stresses easily and mirroring its beautiful, lush nature. To read the full article, please see the January/February 2016 Issue (available in print or digital format). © 1992–2019 Well Being Journal™, Inc.. All Rights Reserved.